Best of Cat Tips < It’s Kitten Season! Spring and Summer are kitten season! Yes, kittens have a season, even parts of the USA that don’t have much change in seasons, like where I am in Southern California. Kitten season has an upside and a dark side. If you’ve been waiting to adopt a baby kitten or – for even more fun – a pair, during kitten season, there are bucketfuls to choose from. It’s still early in the season in many parts of the country, so the dark side hasn’t entirely taken over, and shelters and rescues aren’t overflowing with baby felines just yet. But by June, the tide turns, and as statistics show in so many communities, more and more unweaned kittens are pouring in each year. There are just not enough homes for them all. Statistical information from some city shelters is accessible, if overwhelming. Los Angeles Animal Services (LAAS) offers transparency in publishing all their intake & outcome figures online, with stats from every month from 2007 through today. 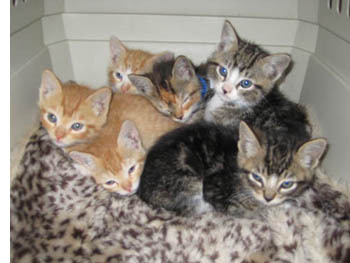 Unweaned kittens, which is kittens under 8 weeks of age, even get their very own report. So… protest at the shelters? I don’t think getting mad at the shelters is helpful. Shelters are a band aid. Here in LA, shelters make underage kittens available to all approved rescue partner immediately, and they follow up militantly for proof that the kittens were spayed and neutered before being adopted out. The shelters save as many as they have room for in their back cages, mostly the ones that are one or two weeks away from being adoptable, so they can save as many as possible. Rescues then step in and save as many as they can through foster homes and donations. California state law says you can’t adopt out pets that aren’t spayed or neutered –a good thing since trying to track down and get pets fixed once they leave a shelter has a very high fail rate– but it does mean adopting out kittens can take longer because they have to be at least two pounds before they can be fixed. In the Los Angeles city shelters, spay and neuter, and rescue efforts resulted in hundreds of unweaned kittens being saved: in 2011 528 were adopted and 271 rescued. But still, that’s only 25 percent. Where do all those kittens come from? Most people are unaware of the magnitude of the kitten epidemic, and so breed and buy kittens from stores aka kitten mills. Most people don’t know that kittens can get pregnant starting when they are about five-months-old. Many people are unaware of (or can’t get to) the low- and no-cost spay/neuter programs available and think they can’t get their cat fixed. Some people don’t believe in fixing their cat and don’t care that means so many kittens are killed as a result. One part of the solution: educate the unaware. If they care, it will help. Talking about kittens with your friends, family, a co-worker, or someone standing next to you in line could convince more people to take action. I share my sadness over how many kittens don’t find homes, and over how many people don’t know how young kittens get pregnant. If they are interested, I will share my local statistics — not some un-graspable vague nationwide “millions” number, but that 7,000 baby kittens (and 13,000 kittens & cats) are killed each year in Los Angeles simply because there aren’t enough homes, fosters and rescues for them all. The other possible solutions: get more people to fix their cats at four-months-old, try to move people away from buying at pet stores or from breeders that add to the numbers of kittens in the world to make a profit, and encourage more people to foster, rescue and adopt kittens from our shelters and rescues.